Serving Brevard County including Melbourne, Rockledge, Viera and Merritt Island. At Ocean Breeze Dental we have earned the right to boast that we make some of the finest dentures in all of Brevard County. They are custom-made in our very own dental laboratory by our master technician with over 20 years of experience. We strive to ensure that they fit with superior precision, providing the patient with maximum comfort and full satisfaction. Having complete dentures will help with chewing, as well as support facial structure and improve speech. No matter which kind you choose, you can be assured to receive natural-looking false teeth that match your facial structure and desired tooth color. While they take some getting used to and will never feel exactly the same as one's natural teeth, our dentures are natural looking and more comfortable than ever. Whether from periodontal disease, malnutrition or genetic disorders, sometimes it is necessary for us to extract all of a patient's lower or upper teeth. While this can be devastating, dentures can provide a second chance at a beautiful smile. An immediate full denture is inserted immediately after the remaining teeth are removed. (Your dentist takes measurements and makes models of your jaw during a prior visit.) While they offer the benefit of never having to be without your teeth, they must be relined or re-made several months after being inserted. The reason is that the bone supporting the teeth reshapes as it heals, causing it to become loose..
A conventional full denture is placed in your mouth after any remaining teeth are removed and tissues have healed. Healing may take several months, during which time you are either without teeth or are wearing an immediate denture. With full dentures, a flesh-colored acrylic base fits over your gums. The base of the upper covers the palate (the roof of your mouth), while that of the lower is shaped like a horseshoe to accommodate your tongue. When handling them, stand over a folded towel or basin of water; they are delicate and may break if dropped. Don't let them dry out. Place them in a denture cleanser soaking solution or in plain water when you're not wearing them. Never use hot water, which can cause them to warp. Brushing them daily will remove food deposits and plaque, and help prevent them from becoming stained. At your annual check-up we will use an ultrasonic cleaner and a polishing wheel to care for them, but it does not replace a thorough daily brushing. Brush your gums, tongue and palate every morning with a soft-bristled brush before inserting them. This stimulates circulation in your tissues and helps remove plaque. See your dentist if they break, chip, and crack or become loose. Don't be tempted to adjust them yourself this can damage them beyond repair. How long before I get used to them? New dentures may feel awkward or uncomfortable for the first few weeks or even months. Eating and speaking with them often takes a little practice. A bulky or loose feeling is not uncommon, while the muscles of your cheeks and tongue learn to hold them in place. Excessive saliva flow, feeling like ones tongue does not have adequate room, and minor irritation or soreness is also not unusual. What can be done if I’m still not happy with the fit? If you find yourself using adhesive regularly or struggling with the loose feeling that many patients experience with a lower denture, then mini implants for support, or another type of dental implant restoration may be the right choice for you. Our dentists and staff will be glad to discuss either of these treatment options with you. It might even be possible to place and attach the implants the same day. Over a period of time, your denture will need to be relined, remade, or rebased due to normal wear. Rebasing means replacing the flesh colored portion while keeping the existing denture teeth. Also, as you age, your mouth naturally changes. These changes cause your them to loosen, making chewing difficult and irritating your gums. At a minimum, you should see your dentist annually for a checkup. Our patients typically get anywhere from 5-20 years use. What is the difference between a removable partial and a bridge? A partial denture is a prostheses that can be taken in and out of the mouth. A bridge is cemented onto your teeth and will not come out unless removed by your dentist. Can you put them in the same day that I have my teeth extracted? I don’t want to be without teeth! Yes, if this is a concern for you then immediate dentures are a good option. We take an impression of your mouth 1-2 weeks prior to surgery. The day we take your teeth out you a healing denture is worn home, never leaving you without teeth. They can become loose for a number of reasons, many of which are perfectly normal. However, if they do become loose, it is important to address this as soon as possible. The most common reason for them becoming loose is a process known as bone resorption. This often occurs when your gums no longer have to hold your teeth in place. Your body tries to reclaim bone mass after your teeth are lost, which causing the bone to shrink down. Why is it necessary to Re-line? During the time you have worn dentures; your mouth has experienced considerable change. Re-lining accounts for this change. What is a soft/hard reline? There are many types of relines. A soft reline is a spongy type material that usually needs changed every few weeks. Dentists usually use these after you have had one or more teeth extracted and your mouth is in a state of healing. 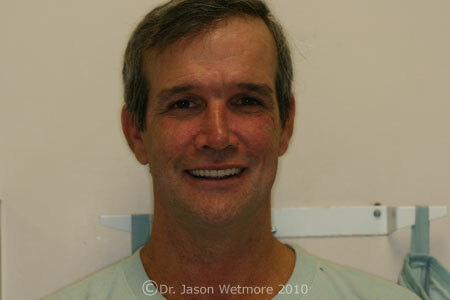 A hard reline is done 6 months or more after extractions or when you have had a denture for several years. In both cases, the bone in your mouth changes leaving a loose or improper fit. The hard reline makes a snug and comfortable fit. Why does “tissue conditioning” have to be preformed prior to Re-lining in some cases? A proper fitting can be fabricated for you only if an impression is made of physiologically healthy tissue. Tissue Conditioning is designed to allow the tissue to relax and return to a normal state of health. Some mouths respond to treatment sooner than others. At your next examination, we will be able to determine what progress has occurred. As soon as your oral tissue is physiologically healthy we will proceed with fabrication. What is the white lining? The white lining is a dough-like dental plastic. This plastic is especially designed to remain moldable at mouth temperature and allow the tissue to restore itself to a healthy condition. How should I clean the Tissue Conditioning lining? Simply rinse the lining with cold tap water. Avoid touching the lining during the cleaning process. Follow your usual procedures for cleaning the rigid portion.